From handshakes to deadlifts, a stronger grip can make a big difference in your life. One of the best ways to improve grip strength is by using a hand gripper or hand strengthener. We’ve reviewed the best hand grippers on the market to help you pick the one that’s right for you. What Makes the Best Hand Gripper? What Is the Best Way to Use a Hand Gripper? Can You Hurt Yourself Using a Hand Gripper? For a beginner to intermediate grip we recommend the Norse Strengths Hand Gripper Set. 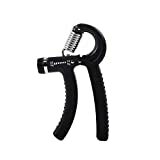 It comes with an adjustable-strength hand gripper as well as two hand therapy exercise balls to round out your grip strengthening tools. The Captains of Crush Hand Gripper is the best hand gripper for those who want a seriously strong grip. This is a non-adjustable hand gripper that comes in increasingly intense weights (each separate purchases). 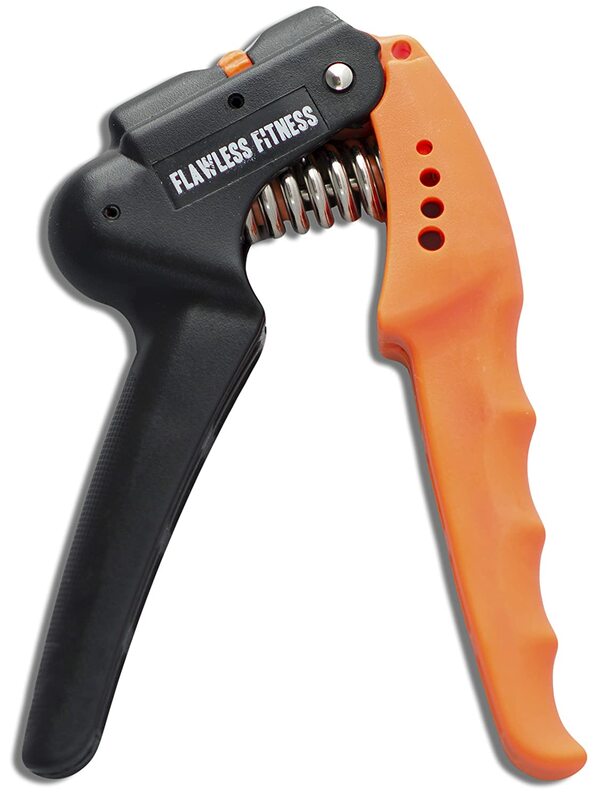 Flawless Fitness Hand Grip Strengthener is an adjustable hand gripper with a unique finger-molded handle, making it best for those who have comfort in mind. However, the top range of this adjustable hand strengthener is slightly lower than for others. 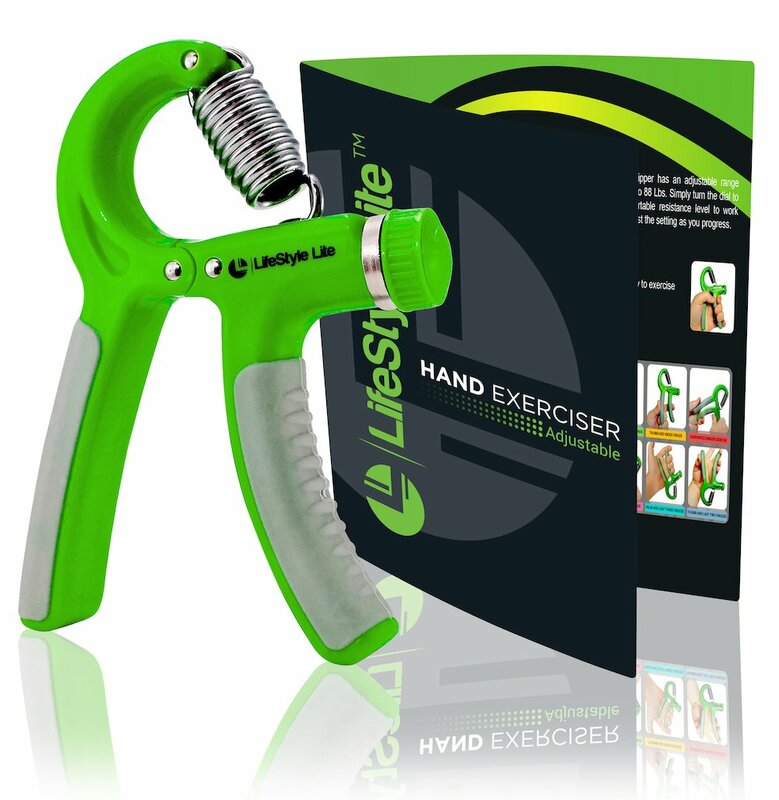 The LifeStyle Lite Hand Gripper is a standard-range adjustable gripper. It is also the least expensive adjustable gripper on our list. 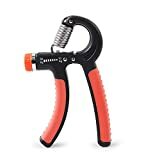 Another adjustable-weight hand gripper, the Amazing Core Fitness Grip Strengthener, is good for those who want a simple yet versatile hand gripper. It is a bit more expensive than other options, although it comes with a lifetime guarantee. This hand gripper is adjustable from light to moderate weight (22 lbs to 88 lbs) and it has a curved handle which is good for all sizes of hands. Where it’s different is in the extra products you get with the purchase. You get the Norse Strengths adjustable hand gripper as well as two different density hand therapy exercise balls. The added hand grip balls allow you to activate your hand muscles from more angles than what’s possible with the hand gripper. This is good if you are concerned with overall hand health in addition to hand strength. The handles are made of molded foam, making this a good gripper if comfort or rough hands are a concern. While the gripper serves its purposes, some people have noted that the therapy balls are sticky, and that the gripper can be squeaky. This hand strengthener comes in 11 different versions, each a more intense weight. It is the most expensive and also the most serious hand gripper we reviewed. 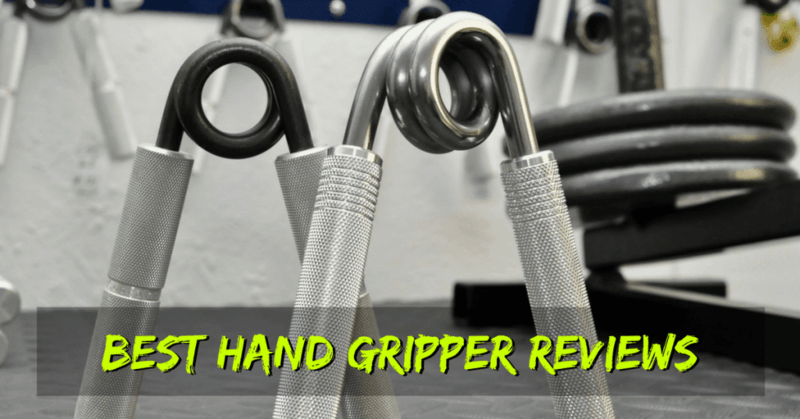 If you want to make a significant improvement to your grip strength over the long term, this gripper is for you. Because you must purchase new grippers to “level up,” it requires more of a commitment than the adjustable alternatives. However, the adjustable hand grippers max out at 88 lbs of force. 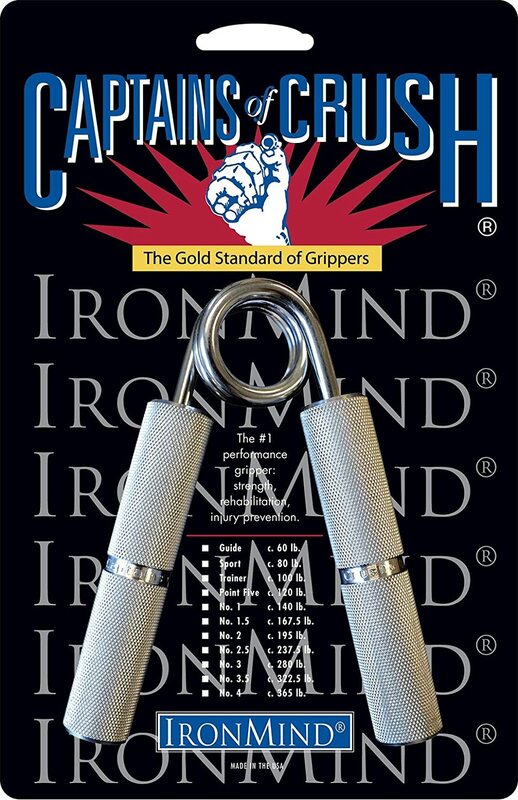 The Captains of Crush Hand Grippers highest weight is 365 lbs, more than four times the adjustable grippers’ weight. These grippers are metal, which makes them slightly less comfortable but at the same time more durable. The Captains of Crush hand grippers start at 60 lbs. Reviewers like the ability to focus on one weight until they are proficient, and the process of “upgrading” to a new weight. The textured handles are rough on some hands, but overall help keep your fingers on the handle. This is an adjustable gripper that has finger notches and an adjustable handle width for different size hands. The weight goes from 22 lbs to 70 lbs, giving it the smallest range of the adjustable grippers (the others we reviewed are 22 lbs to 88 lbs). The notches on the handle help keep your fingers in a consistent position, and make for a more comfortable experience. The handles are plastic, and the spring is protectively housed under a casing so it cannot pinch you. This gripper is a lower-cost option. Reviewers in general feel it works as described, although some note that the plastic can feel flimsy and it sometimes squeaks. This is the lowest-cost option of the hand grip strengtheners we reviewed. It is similar in construction to the Norse Strengths gripper, although unlike the Norse Strengths gripper it does not come with any additional hand grip tools. It is a fully adjustable gripper with a range of weights from 22 lbs to 88 lbs. Made of plastic, the LifeStyle Lite gripper has a durable foam handle for the comfort-minded. The curved handle allows for multiple hand positions, from upright to upside down, etc. Complaints with this gripper are rare but note that with excessive force the spring could break, and the handle is short such that larger hands might not fully fit on the gripper. This is an average-priced gripper whose main benefit is a lifetime guarantee. It is adjustable over the full standard weight range of 22 lbs to 88 lbs. It comes with a lifetime guarantee. The extra dollars spent on the base unit could therefore pay off in the future if it were to break. Reviewers reported that some breaking did happen, from cosmetic issues like the dial cap falling off to structural issues with the way the spring attaches to the unit. 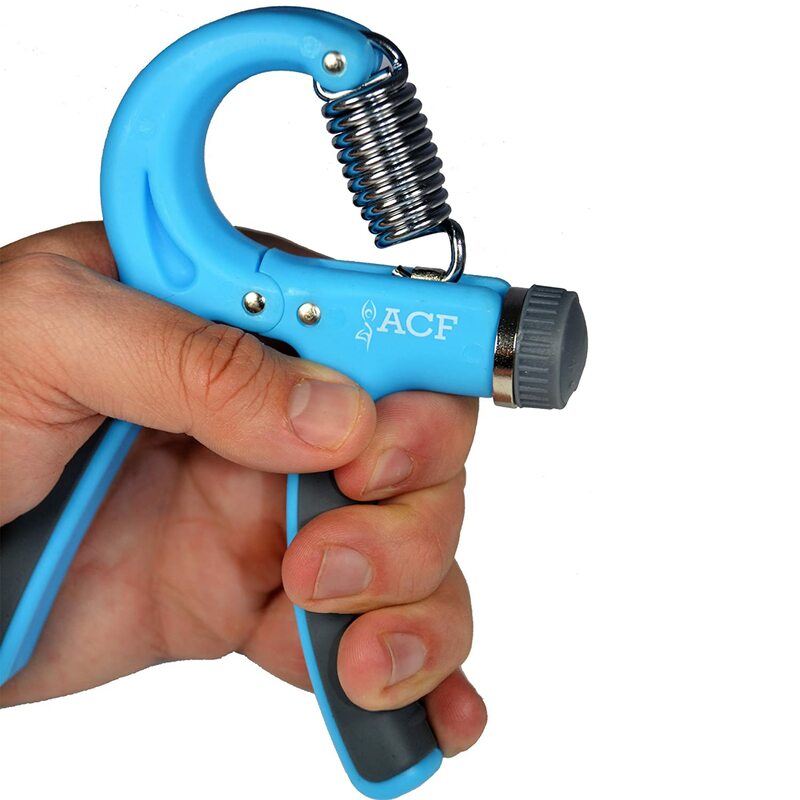 Rare cases reported hand irritation with excessive use, but in general people like this hand grip strengthener. Grip strength is important because hand grippers come in different “weights.” These weights indicate how much force is needed to squeeze the girpper shut. A standard gripper will have a weight from 22 lbs to 88 lbs, and many are adjustable. If you have never used a gripper before, it is best to start with an adjustable, lighter weight option. Even if you can squeeze the 88 lbs with ease, it is important to let your hand and forearm get used to the motion before putting it under excessive tension. 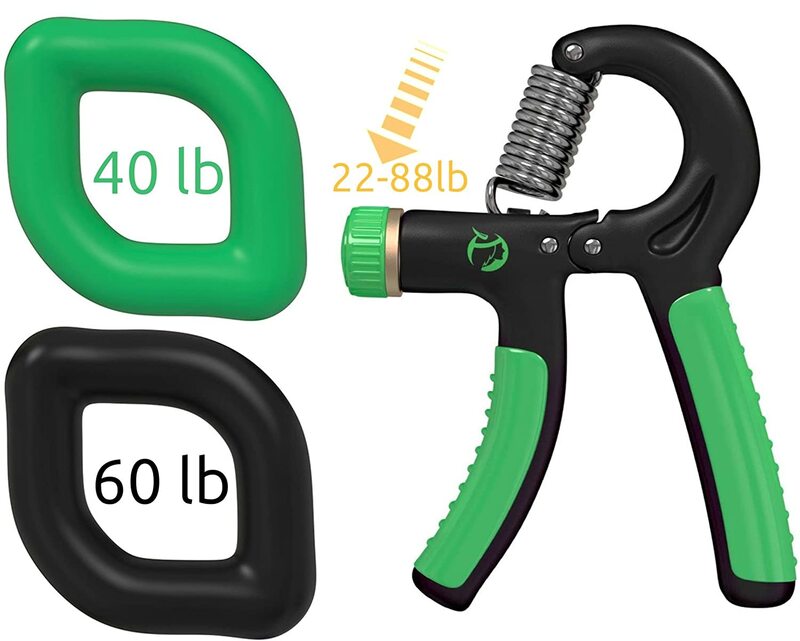 If you are looking for a gripper to take your grip strength from intermediate to advanced, there are different grippers of different weights from the lowest 22 lbs and up to 365 lbs of force. Understanding your goal for improving grip strength will help you pick the best gripper for you. For instance, if your goal is a firmer handshake, you probably don’t need to work your way up to the hand gripper that requires 365 lbs of force. For most uses, a gripper with a weight from 22 lbs to 88 lbs will be sufficient. Using a hand gripper activates many small muscles and tendons in your fingers, hand, and forearm. For this reason, you should not use a hand gripper every day. 3 days per week is a good number to see results. Squeeze the hand gripper on a light weight (if the tension is adjustable) or over a reduced range of motion (if tension is not adjustable) to prepare your muscles. Perform 5-12 repetitions with a tension that makes it difficult to finish the final squeezes. Do three of these 5-12 repetition sets. In general, 3 sets of 5-12 repetitions 3 times per week will build your hand strength while allowing your hand and muscles to recover between sets. Some people are tentative to use a hand gripper because they think it will lead to injury. In fact, hand grippers are often used to prevent injury because they strengthen small and sometimes weak muscles. Hand grippers, when used thoughtfully and in moderation, will make you stronger. But, just like with overusing any exercise equipment, overusing a hand gripper can cause injury. People have reported finger discomfort, hand pain, and wrist pain after excessively using hand grippers. We recommend easing into the hand gripper routine and following a regular regimen. This allows your muscles and ligaments to get used to the movement and will help you get stronger faster, even if it feels slow at first. Everyone will have different goals for getting a hand gripper. Some just want it for practical everyday reasons like a stronger handshake, while others want to drastically improve their grip strength. Purchasing a hand gripper at random is one way to start, but it is better to match the gripper to your goals and ideal use. In this review, the Norse Strengths Hand Gripper Set is the best all-around hand gripper. It has a fully adjustable weight range from 22 lbs to 88 lbs, it has a curved handle with comfortable hard-foam handles, and it comes with hand exercise therapy balls. The wide range of weights and added exercise balls justify spending a couple extra dollars. The Norse Strengths gripper can be used to reach most goals, and it is a good stepping stone to more intense grippers if you have a good experience with this first one.